The Solva Compact Travel Mobility Scooter by Roma Medical has a modern design with a high weight limit and is packed with features. This mobility scooter is specifically designed to be quickly dismantled without tools for easy transportation and will fit into most car boots. Even though the Solva is a compact travel scooter, it still boasts some excellent features including a comfortable height adjustable seat, spacious leg room, flip up and width adjustable armrests and non marking puncture proof tyres. It can also reach a maximum speed of 4mph, has a 21 stone maximum weight capacity and a range of 8 miles on a full battery charge. The battery can be charged either on board or off board. 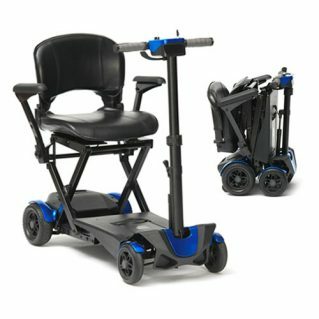 The Solva Travel Mobility Scooter is available either Red or Blue.